Synopsis: In the Tudor Court of 1518, your friends and enemies can be one and the same...During the annual celebration of the Order of the Garter, Sir Michael Devereaux arrives in King Henry VIII's court on a mission for his benefactor. The celebration's endless feats and sumptuous women delight the charismatic newcomer, who becomes captivated by the enigmatic Princess Renee of France. But evil, it seems, has followed Michael to the court. Shortly after his arrival, an unknown killer claims several victims, including the Queen's lady-in-waiting, and the powerful Cardinal Wolsey asks Michael to help with the investigation. As he searches for the killer, Michael is haunted by disturbing images of the victims - flashes of violence that lead him to doubt his own sanity. Michael soon realizes that the key to solving the crime is connected to both the Pope's Imperial vault in Rome and a mystery from Michael's own past - revealing a secret that is so damning, it could forever alter the future of mankind. Giveaway ends on May 24th. Winner will be announced on May 25th. A big thanks to Rona Sharon for making this giveaway possible! Please enter me! Thanks! I'm already a follower and my e-mail in on my profile!! Oooh, I like the synopsis. Enter me in the giveaway, please and thank you! I posted the link in my sidebar! I would love to win this. I am already a follower. My email is dolleygurl@hotmail.com. I posted about this in my blog http://themaidenscourt.blogspot.com/. I'd like to win this. I'm a follower. NO need to enter me Amy.. 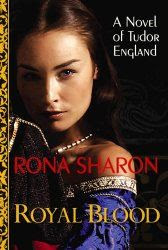 I am enjoying this book right now.. just started it before watching the Tudors last night.. :) Great Giveaway !!!! Tudor and vampires, what could go wrong. I wrote about the give away here and I also follow your blog. Please enter me! I'm also a follower! Enter me...this book sounds good. I follow your blog via GoogleReader. I'd love to win and read this! Sounds like a Tudor novel with a new and different slant. Please include me in the giveaway. Please enter me. I think Rona Sharon is one of the most unique voices out there right now and have really enjoyed her last two books! Her last one made me even cry!! I have went to my local bookstore and the books are sold out..which is good for Rona but bad for me! So I'm definetly crossing my fingers!! I'd love to read this. It sounds great. Please enter me. Count me in please. I am a follower. Sounds absolutely awesome. Would love to read it. This would be a great book for mom. Sounds interesting. Thanks for the chance to win! Sounds like a great book! Please enter me and I am a follower. I also have the book and a link back to you on my side bar. Have a great day!! Please enter me! I love books about the Tudors!! Please enter my name for your giveaway. Love books that take place during the Tudor era. Thank you. I definitely want to read this one. Thanks for the giveaway! And I'm a follower on Google Reader, if that counts. Please sign me up...this sounds like a great book! As a fan of The Tudors television series, this one looks particularly enticing to me! I just want to say Amy, that I found you through Lucy Bertoldi and my very favourite author is Diana Gabaldon so when I saw you had placed the cover for An Echo in the Bone on your blog, my eyes lit up! I also love Edward Rutherfurd's books too so I see we definitely have some similar tastes. I look forward to learning more about you and the books you love. Just the kind of book to keep me company on hot summer nights. Looks like a book I'd really enjoy - please count me in! This book sounds exciting. I love Tudor historicals. Is that Vienna from As The World Turns on the cover? Please enter me. I would love to win Amy. I follow via Google Blogger. Please enter me into the draw! Sounds like a great read! Hmmm. This one has an interesting twist -- I'd love to read it. Thanks for the chance to win a copy. I am a follower and I would love to read this. I would love to own this book! Fantastic giveaway! I would love to be entered please. Thanks! I've never read Rona Sharon, I'd love to start with this one. Following on Facebook, thanks Amy! Please count me in! I've been wanting this book for a while! I'd love to win a copy of this book. I'm a follower! I Love historicals and this one sounds good ! I THINK I am a Follower, I clicked the button to do so but I am not sure it went tru alrright ? Please include me in your giveaway! Thanks! Please sign me up for this one. This sounds like a great book, please enter me in the giveaway also! Hello! This sounds like a great read, please enter me. Thanks! !